Uttaranchal finds mention in the ancient Hindu scriptures as Kedarkhand, Manakhand and Himavat. The Kushanas, Kudinas, Kanishka, Samudra, Gupta, the Pauravas, Katuris, Palas, the Chandras and Pawaras and the British have ruled in turns. It is often called the Land of the Gods (Dev Bhoomi) because of its various holy places and shrines. The hilly Regions of Uttaranchal offer un spoilt landscapes to the tourist -pilgrim. The present state of Uttaranchal was earlier as part of the United Province of Agra and Awadh which came into existence in 1902. In 1935, the name of the state was shortened to the United Province. In January 1950, the United Province was renamed as Uttar Pradesh and Uttaranchal remained a part of Uttar Pradesh before it came into being on 9 November 2000, the 27th state of India. Earliest tangible evidence of the history of Dehradun is glimpsed from a rock in scrimption of Emperor Ashok, 3rd century, BC, which was exposed in 1860 AD by a Britisher, Mr. Forrest, near Kalsi. The region then formed part of the Emperor's domain, after disappearing from history, perhaps, because it was deserted, it re-emerges in the territory of the Katyuri dynasty of Garhwal. In late 18th century it was conquered by the Gorkhas of Ran Bahadur of Nepal, who were replayed by the British in 1815 AD. Under the British, Dehradun became an elite town with many a fine institution like Forest Research Institute, Doon and Welham Schools, Many more, like the ONGC and Wdia Institute of Himalayan Studies, were added in time. Dehradun has now became an important tourist destination, too for its surroundings offer to interest a visitor. It occupies 17.3% of India�s total land area with 51,125 sq. km. It has a population of about 6.0 million at 94.4 per sq. km. It borders Tibet, Nepal, Himachal Pradesh. This state is the source of the sacred Ganga river, high in the mountains, and the spiritual and physical life source of India. The mighty Himalayas straddle the state, on its northern borders, and are widely believed to be throne of Gods. Most of the districts of Uttaranchal are a element of the Himalayan ranges. At 7,817 m above sea level, Nanda Devi peak in Chamoli is the highest point in the state. The region has many glaciers, passes, meadows, and trekking routes with several major rivers like the Ganga and Yamuna originating from the state. A major part of this state is covered with rainforests and alpine forests that are the dwelling places for some of the highly rare wildlife species. Uttaranchal is a major attraction with tourists in search of eternal peace, for a change from their usual way of life, to live life on extremes and as pilgrims. 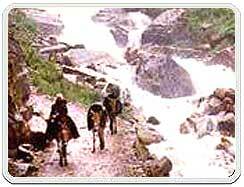 And if you are planning to tour Uttaranchal, the state is without difficulty accessible by air, rail and road. The only airport in Uttaranchal is in Jolly Grant, Dehradun that receives regular flights from Delhi. Various regions of Uttaranchal- Dehradun, Haridwar, and Kathgodam have excellent network of rail tracks that connect the Uttaranchal with major cities of India. Uttaranchal is serviced by an excellent network of roads that makes it possible to travel to Uttaranchal through personal conveyance.